McDougall, Sophia. 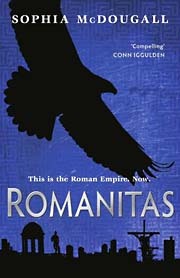 Romanitas . Orion UK 2005. Summary: The Roman emperor Pertinax discovered Laetus' Praetorian plot to overthrow him. As a result he lived an extra eleven years and his son initiated the empire's renewed expansion and the Empire never fell. 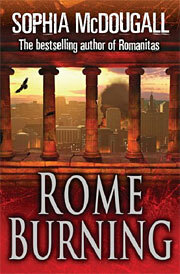 Series note: Trilogy including Romanitas , Rome Burning , and Savage City . McDougall, Sophia. Romanitas . Orion/Gollancz 2011. 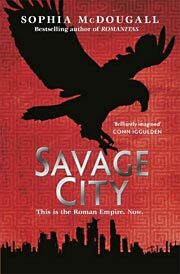 Summary: In the year 2757 AUC (2004 CE), the young nephew of the Roman emperor flees after the murder of his parents and an assassination attempt on his own life. After taking refuge among slaves, he commits to exposing the plot and, should be become emperor, to ending slavery. Series note: First volume of the Romanitas Trilogy. Published: Orion UK 2005 (075286078XBUY, 0752868942, 0752865080), 2006 (0752877097), Gollancz 2011 (0575096926BUY). McDougall, Sophia. Rome Burning . Orion UK 2007. Summary: Set three years after the events of Romanitas . Series note: Second volume of the Romanitas Trilogy. Published: Orion 2007 (0752860798BUY, 0752874276BUY, 0752893785), Gollancz 2011 (0575096934BUY). 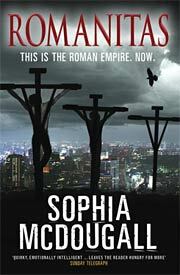 McDougall, Sophia. Savage City . Orion/Gollancz 2011. Series note: Third volume of the Romanitas Trilogy. Published: Orion/Gollancz 2011 (0575094885, 0575094877), 2012 (0575096381BUY).